Hey there - my name is Christian Kelly. I'm 19 years old, and if you haven’t figured it out by now, I have a thing for cooking. I love food. Food makes me happy, it’s my passion. I enjoy being funny and making people laugh. It's a part of my personality I really like. I just love seeing people happy. And cooking does just that for me. It allows me to make people happy by making something that appeals to their taste buds, therefore putting a smile on their face. I enjoy helping people. I get satisfaction knowing that somewhere out there, in this world of over 7 billion people, someone was able to benefit from what I love doing. Ever since I was about 5 years old, I've had an interest in food, other than eating it. I guess it was due to the fact that I've been exposed to cooking for as long as I can remember. Whenever my Grandmother or Aunts were cooking, I would always find myself in the kitchen either helping or simply watching. They were like my “Rachel Ray” of the day. One other thing I can remember to this day was, when my brother, sister, parents and I moved into our new home in Jersey, those first couple years, we ALWAYS cooked. I mean, on a nightly basis. My Dad was pretty much the chef of the house, he was the one to do most of the Sunday cooking, the fancy dinners, and there have been plenty of times when I had to ask him “where did you learn to cook” because everything he made, I was impressed with, I kid you not. But what stuck with me the most was when we used to all be in the kitchen together, as a family, all preparing dinner. My Mom and Dad were the “Head chefs”, my brother and sister like the “Prep cooks”, making salad and whatnot. And me? I was the audience. Just standing by, watching, observing. Gradually, I went from being the audience, to “Prep cook”, to “Sous Chef” to one of the “Head Chefs” (of the kitchen). 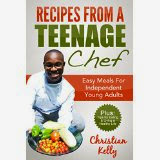 Now, this book addresses a couple of topics like obesity, healthy eating habits, how to save money while in the kitchen, and exercise, even a chapter based on some of Dr. Oz’s powerful tips for leading a healthier lifestyle, and his “Power Foods.” I’ve also included the first twenty-one recipes I tried: some I created and some are original recipes I simply made my own by adding my own twist and changing things up. These are recipes I’ve been working on since my early teens. I want you to enjoy this book, and my biggest hope is that it will bless you in many ways. I thank you in advance for all of your support.